Great Friend to MARFC Passes! I am sorry to report the passing of longtime Promoter/Owner of the Spartan Speedway Paul Zimmerman. All of us here at MARFC express our condolences to Paul’s family and friends. “Poor Paul” was a great friend not only to MARFC but to the entire sport as well and really put his heart and soul into Spartan as well as the Springport Speedway. On a personal note I was able to work with him through my association with MARFC and Michigan Legends Cars as well as to serve along with him on the Board of Directors of the Michigan Motor Sports Hall of Fame. Paul had an infectious personality that just made you feel good being around him and to have him share his knowledge and friendship with you. He was always there with a handshake or a pat on the back and always had kind words of encouragement for me as well as joke or two. I will miss his smile and his act of innocence. Those of us that got to know him knew that under the gentle and humorous personality that Paul presented, He was very serious about making his tracks the best they could possibly be and that the fans and drivers were number one with him. You could find Paul doing so many of the jobs at the track from cutting the grass, parking cars, selling tickets and walking around shaking hands. 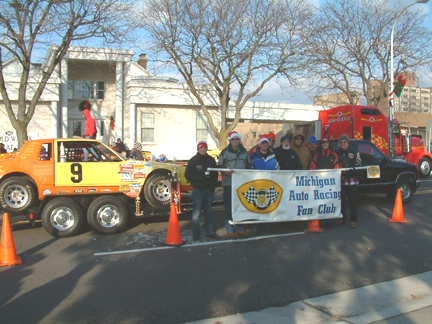 A past recipient of the MARFC and the Michigan Speedway Promoters Association, Promoter of the Year Award showed that Paul carried much respect amongst his peers. God’s Speed Paul and rest well my friend. Arrangements for Paul are visitations on Tuesday the 28th from 5 to 9 pm at Gorsline-Runciman/Ball Dunn Chapel, 621 S. Jefferson, Mason, MI, 48854. The funeral is on Wednesday the 29th at the Aurelius Baptist Church, 4419 W. Barnes Rd. Aurelius, MI. There will be a viewing at 10:00 am and the Service is at 11:00 am. With the holiday season coming upon us later this month we here at MARFC send out a “Very Merry Christmas” and a “Happy New Year” to all of our members across the state and country. May God Bless and keep us all safe throughout this holiday season. Just a reminder that our 45th Annual Awards Banquet is scheduled for January 15, 2011! Tickets are now on hand at a donation of $ 39.00 each. So if you are planning on attending this event get your tickets early as there will be NO TICKETS SOLD AT THE DOOR! You should receive your tickets in the mail the first week of January so be on the lookout. Last years weather was excellent so let’s hope and pray for the same this coming year as well. 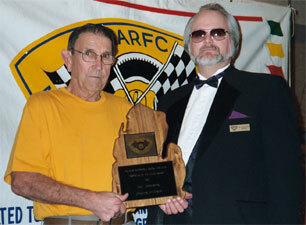 As promised in last month’s newsletter, I can now share with you all that the recipient of the MARFC Presidents Award for 2010 is The Hugh Fair Family which includes the late Hugh Fair, his son Harold Fair Sr. and Grandson Harold Fair Jr. Three generations of winning drivers who have thrilled many generations of race fans with their exploits and skill as drivers on race tracks all over the state of Michigan as well as the mid-west and parts beyond. As detailed last month, Mel Kenyon will be receiving the Eddie Sachs Jr. Memorial Lifetime Achievement Award, George Pohly will receive the MARFC Motor Sports Writer of the Year and Gary Ritzenthaler will be receiving the MARFC Electronic Media Award for his website Water Winter Wonderland. Now is the time to renew your membership for 2011. In order to save the club mailing costs we will be removing members who have not renewed as of our February newsletter so make sure you get your renewal in ASAP. Also remember that a MARFC membership or renewal makes a great Christmas gift to the race fan in your family. As always any questions or comments contact me at: Dave DeHem E-mail president@marfc.org. As Dave stated earlier the 2011 memberships are due and we need your assistance once again in up dating all your e-mail address. We have moved our mailing list to a new service and need you to contact me at vicepresident@marfc.org with your current e-mail address because we have so may that are old and not current we just cleaned house and have lost a few in the transfer. Even if you are currently getting the online version of the monthly newsletter please send me a note to lock in your address the new service. Please add your name along with your address because sometimes it is hard to tell who you are by just your address. 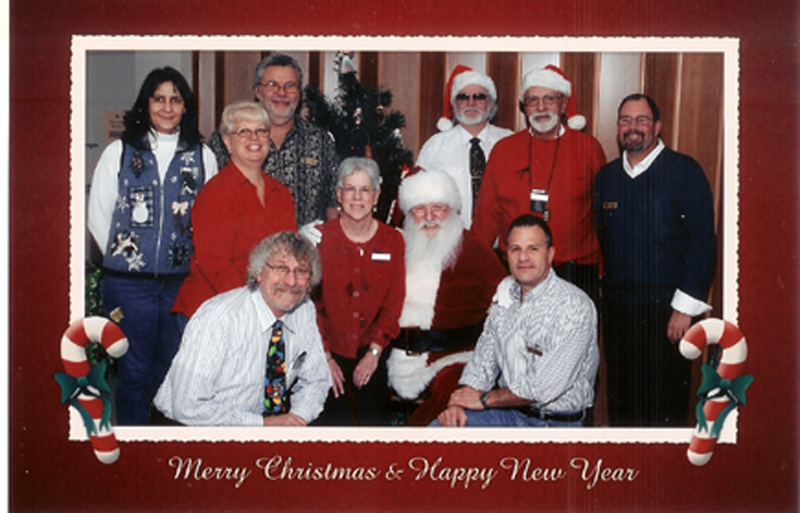 Many thanks for your continued support of our club and have a Very Happy & Merry Holiday Season! Bill Barnhart Vice President MARFC. MARFC in MT. Clemens Christmas Parade! 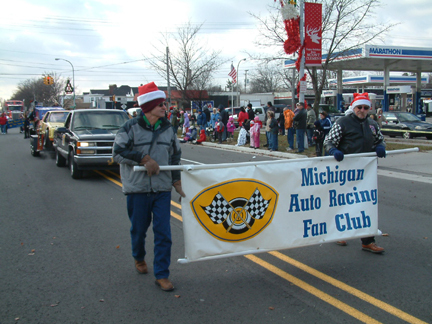 Once again the Michigan Auto Racing Fan Club was invited to be a part of the Annual Mt. Clemens Christmas Parade for 2010. Our chairperson for this event was board member Laura Tucker who worked to get us Jeff Metdepenningen’s ARCA Flat Rock Enduro and Factory Stock car to have on display for this year’s parade. Very cold temps and fast paced winds made for a quick paced parade. Many thanks to all who marched in the parade and help support our club. Volunteers were: Jeff & Kyle Metedpenningen, Scott Menlen, Steve Stein, Chuck & Jeff Horan, Laura Tucker, Bill Walters, and Larry Iacoboni.